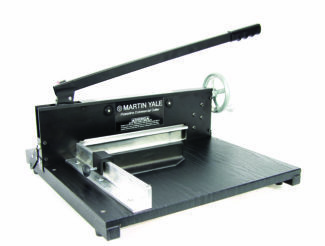 Martin Yale paper cutters and paper trimmers are the benchmark by which the rest of the industry is measured. Our trademark Green Board™ can be found in nearly every school across America and has been recognized worldwide as the original and leading wood base trimmer since 1940. If you’re looking for a trimmer that will give you the highest quality cut with more sheet capacity, these are the paper trimmers for you. 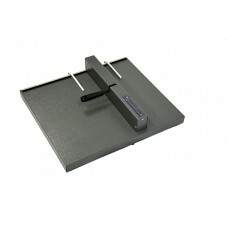 Martin Yale paper trimmers are known for rugged durability. They will stand the test of time under even heavy use. In fact, many are still in use in schools today, after decades. Our paper trimmers feature the patented Auto-latch for ease of use and safer handling in a variety of types, sizes and construction for every application and budget. Blades are fully hardened, high-carbon, self-sharpening steel with a limited lifetime warranty. 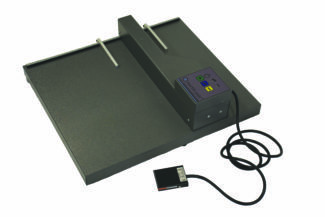 GreenBoard™ Series W12 Heavy-duty 3/4" thick wood base, capable of trimming matte board, cardboard, film, tissue, textiles and up to 20 sheets of 20 lb. paper 12"L 20 11.75" No 12.5" x 11.5"
W15 Heavy-duty 3/4" thick wood base, capable of trimming matte board, cardboard, film, tissue, textiles and up to 20 sheets of 20 lb. paper 15"L 20 14.50" No 12.5" x 14.5"
W18 Heavy-duty 3/4" thick wood base, capable of trimming matte board, cardboard, film, tissue, textiles and up to 20 sheets of 20 lb. paper 18"L 20 17.50" No 18.5" x 17.5"
W24 Heavy-duty 3/4" thick wood base, capable of trimming matte board, cardboard, film, tissue, textiles and up to 20 sheets of 20 lb. paper 24"L 20 23.50" No 18.5" x 23.5"
W30 Heavy-duty 3/4" thick wood base, capable of trimming matte board, cardboard, film, tissue, textiles and up to 20 sheets of 20 lb. paper 30"L 20 29.50" No 23.5" x 29.5"
WC36 Heavy-duty 3/4" thick wood base, capable of trimming matte board, cardboard, film, tissue, textiles and up to 20 sheets of 20 lb. paper 36"L 20 36.50" No 23.5" x 36.5"
SharpCut™ Series T12 Medium-duty trimmer made with 1/2" thick wood base, light weight alternative to Green Board, trims up to 15 sheets of 20 lb. paper up to 12"L 15 11.75" No 11.5" x 12.0"
T15 Medium-duty trimmer made with 1/2" thick wood base, light weight alternative to Green Board, trims up to 15 sheets of 20 lb. paper up to 15"L 15 14.75" No 11.5" x 15.0"
PolyBoard™ Series P212X Economical solution for a lightweight unbreakable base guaranteed for a lifetime of use for trimming up to 10 sheets of 20 lb. paper up to 12"L 10 11.50" No 11.0" x 11.5"
P215X Economical solution for a lightweight unbreakable base guaranteed for a lifetime of use for trimming up to 10 sheets of 20 lb. paper up to 15"L 10 14.75" No 14.75"
P218X Economical solution for a lightweight unbreakable base guaranteed for a lifetime of use for trimming up to 10 sheets of 20 lb. paper up to 18"L 10 18.00" No 18.00"
StakCut™ Series 715 Heavy-duty 3/4" thick wood base made for heavy-duty jobs, clamp secures paper stack and prevents shifting to deliver straight cuts, trims up to 30 sheets of 20 lb. paper up to 15" L 30 14.50" Yes 12.5" x 14.5"
724 Heavy-duty 3/4" thick wood base made for heavy-duty jobs, clamp secures paper stack and prevents shifting to deliver straight cuts, trims up to 30 sheets of 20 lb. paper up to 24" L 30 23.50" Yes 18.5" x 23.5"